Provides a safe, durable and effective means of feeding or hay and grain from the same feeder. The feeder is constructed of heavy galvanized steel and hay rack is constructed from solid, galvanized rod. 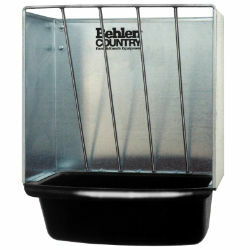 Includes a poly trough that is rust and corrosion free.